Since February 2014, at a resort of international importance “Gudauri”, the company “Atlantis” officially develops paragliding. The company organizes commercial flights on a paraglider with qualified instructors-experts of paragliding sports. Pilots of Atlantida have licenses confirming their high level of qualification in the territory of Ukraine, Switzerland, Nepal and Georgia. In early 2017, local residents from nearby villages showed interest in paragliding. They began to bulk purchase flying equipment (paragliders), not thinking about obtaining a qualification. The desire for easy money became stronger than security. Due to lack of experience from the newly-made pilots, there have been many incidents, but local authorities and the police in no way react to what is happening. The number of new pilots in Gudauri grew by leaps and bounds. There were local paragliding groups, which, under the slogan “This is our land,” began to demand money for flights from pilots working in Ukrainian and Russian companies. Extortion was handled by Irakli Kapanadze, the head of the newly established flight public organization. In June 2017, the Russian pilot Yaroslav Sokolov and his assistant Zviad Alania were in serious trouble. The local group of “pilots” liked to engage in robbery. In this case, a criminal case was opened: some of the attackers were rumored to have been conditionally acquitted. The local Georgian paragliding group grew very fast. Russian and Ukrainian pilots, who were pioneers of paragliding in Gudauri, became heavier and heavier. As a result, in August 2017, the paragliding company Atlantida LLC headed by Anatoly Mihaylyuta decided to lease a separate piece of land. Atlantis won an auction for a 1 hectare land site located a few kilometers above the Gudauri resort and relocated to a new location. For the comfort of the customers, there was a mini-café with all conveniences for recreation on the nature and commercial flights on the paraplane. The first three days of renting a land plot, the local group of “pilots” did not leave the land belonging to the company “Atlantida” rightfully. With great effort, within three working days, with the help of law enforcement agencies, justice triumphed and the group left the leased area, blocking the road to the leased area. During the entire lease of the land plot by Atlantida (to this day for about a year), the local paragliding group blocks the road leading to the leased land in various ways. The company “Atlantis” continues to incur losses, travel to travel companies is closed. But at the same time, monthly rental of land requires 4168 GEL. Where to get money from? Local police continue to remain inactive. The group of “pilots”, in the number of more than 20 people, took advantage of the convenient moment, beat employees of the company “Atlantis” directly on the leased land. Group custody and lack of resistance are confirmed by CCTV cameras and many witnesses. Local “robbers” flew on paragliders from the south, and the rest waiting for a convenient moment – from the north and east side. Pilot Dmitry loudly informs the pilots coming to the landing: “Landing is prohibited, fly to yourself.” Despite the repeated warning, the pilots land. Dmitry helps put the wing landing and drags one of the wings over the territory of the leased area. A group of about ten people brutally beats Mikhail Dmitriy, and then, grabbing at his feet, tries to throw him into the cliff. The camping worker Ruslan Demchuk was beaten for video by fixing the incident on the phone, and his phone was taken away and not returned. In a moment Anatoly Mihailuta will land, who has been watching from the height all this time, carrying out the paid flight. Anatoly approached the “robbers” with the video camera turned on. Tries to find out the reason for their actions. The camera is knocked out of Anatoly’s hands. Like Dmitri and Ruslan, Anatoly is being rolled to the precipice with screams: “You wanted to kill our pilot and for that we’ll kill you.” Dmitry miraculously slips out of the hands of murderers and runs away. Seeing a huge crowd of tourists-witnesses killers stop and diverge. A few minutes later, Anatoly Mihailuta summoned police and ambulance. After the bandits got tired and retreated, Anatoly and Dmitry somehow got to their feet. There was a strong shock, on our plot of land, with the police and with working surveillance cameras, we were nearly beaten to death … At this the gang did not stop and in front of the police the bandits continued to smash everything that was on the territory of our site: from the banner at the entrance to the site to the car in the parking lot, owned by Mihailuta Anatoly. Throughout the night, from 08.06 to 09.06, the battered victims were interrogated by the police. 09.06.2018, early in the morning, the gang on freedom blocked the road, not even allowing workers to land on the land of Atlantis. At that time, in the presence of the police, robbery and theft of the Atlantis company were committed on the site. 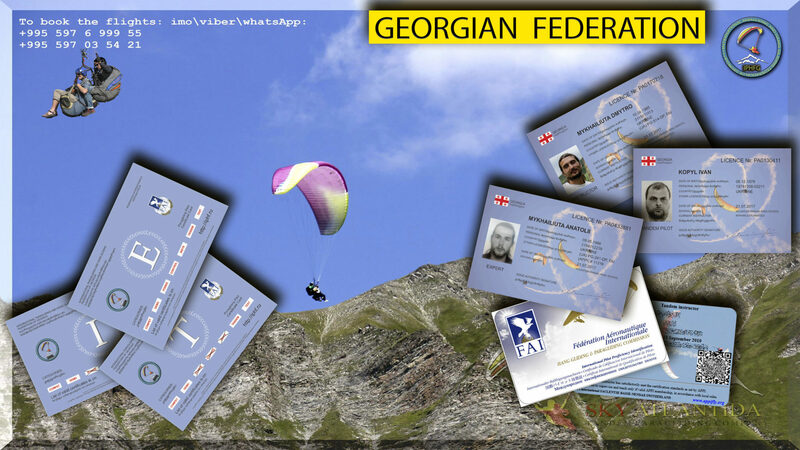 On June 9, 2018, around 12:00 o’clock, paragliders Fedor Chelyshev and Sergey Dementiev were forbidden to travel to the site. When trying to drive to work on the territory of the leased land, the road was blocked by local bandits. As you can see from the video, Fedor tries to find out what happened, but the conversation does not work. Fedor is beaten and he gets to the hospital. 09.06 Dmitry and Anatoly, as well as Demchuk Ruslan’s health deteriorates and they decide to go to the hospital for examination. On the way to Tbilisi, they learn from pilots who were not allowed into the territory of their site, that everything is broken by local bandits paragliding. 10.06 The police and experts will travel to the territory of the leased area to fix the damage. As you can see from the video, the first thing that caught your eye was the torn flag of Ukraine and the United Arab Emirates. The bandits left only the flag of Georgia. The eyewitnesses had no words from what they saw. These are not people, animals. Local bandits who fly not officially have been interfering with official work in Gudauri for several years, but there has not been such a serious conflict yet. The slogan of criminals: “This is our land and we will not let anyone work here!” If you came from Tbilisi or Batumi – go back if life is precious, if you are a foreigner, we will kill you !!!. Bandits are trying to break down foreigners, but people continue to go to qualified pilots. First of last year, one local bandit started flying, last summer he taught another, and by the winter they were already 12 !! NO EXPERIENCE, NO LICENSES AND IMMEDIATELY TO TAKE TOURISTS AT THE TANDEM !!! I think everyone understands that this is dangerous! Recently, the same gang released a ride on a quad biker from India. Unprepared dangerous cliffs without signs of danger and lack of supervision-death of two tourists.The son and father died before the eyes of his wife and brother. The official version of the police is rumored – an accident! PEOPLE, CHECK THE LICENSE OF YOUR PILOT BEFORE THE FLIGHT. To fly with a non-qualified pilot is like roulette: unlucky or lucky. Take care of yourself.